Lois Lane sits behind the wheel of her car in disbelief. Not over the fact that Superman is flying her to his North Pole Fortress; but because he's recently revealed himself to be both Clark Kent and Superman! Lois is familiar with Superman's home but it's been some time since she's been here - things are different. Lois settles in and washes up before Superman gives her the grand tour. He arrives with flowers from alpha�centauri four, they sing. Superman shows Lois his armory, where he keeps weapons he's confiscated. A time telescope allows Superman to talk to his descendants in the year 853,450. They skip the the Phantom Zone Map Room - Lois can't see radio negative antiwaves. Finally the�menagerie where Superman introduces a baby sun eater he wrangled just outside Jupiter's orbit. Just made it for feeding time. But Lois spies something around the corner... an open door. Instinctually she takes a peak and discovers horror. A mist clouds the air - she can see one of Superman's Robots working at a�dissecting machine - her genetic read outs on a monitor behind him. Superman�interrupts and escorts Lois back to her room. Later Superman and Lois settle in for a romantic dinner aboard the salvaged titanic. But as always, Lois is full of questions. She still can't�wholly accept Superman and Clark as the same man. Superman wouldn't lie would he? If this is all true than Superman's been lying to her for years. Lois storms back to her room where delusions of�paranoia take over. Has Superman lost his mind? His over�exposure to the sun has�tripled his powers and mental capacity, even by his own admission. It's very possible it changed his mind as well. He could have brought her to the Fortress as part of a plan to create an�army of Supermen; genetic offspring that would have no trouble conquering the world. She needs to protect herself. In actuality Superman isn't plotting. In fact he's sulking. He can't very well tell her that he's dying and that he wants this time together because it may be their last. Lois dashes through the halls of the Fortress and finds herself in the armory. She snatches up a Kryptonite ray gun. Suddenly a figure appears in the nearby time telescope. It's the unknown�Superman from 4500 A.D. He is a�horribly disfigured Superman - vivid evidence of Superman's plan for progeny. Superman has gone too far, he must be stopped. Lois rushes to Superman's lab, she calls for him - knowing he'll come running like he always does. When the lab door�swooshes open she doesn't hesitate, she fires. Before she can realize what she's done Superman emerges from a green cloud of light. Dangerous way to discover he's now immune to Kryptonite. Superman isn't mad of course, it's�entirely his fault. The lab gas Lois was exposed to earlier was a highly toxic substance used in his genetic research; it has�ghastly paranoid side effects. That machine she saw earlier was actually a super sewing machine and those genetic charts were part of Lois' birthday present. Superman's crafted her a vial of neo genes that will give her his powers for 24 hours. And what good would a super hero be without an�indestructible super costume? 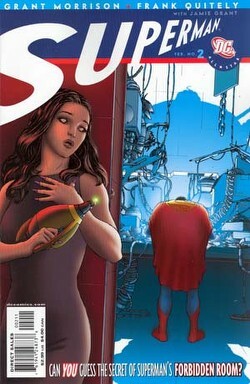 Story - 5: It was inevitable that issue two would follow up on Superman's revelations to Lois. In the current trend of decompression story telling you might expect this to be a slow talky issue. Instead it's an intriguing, talky issue. The�differences between the two might seem small but they are worlds apart. Lois' paranoia turns a tour of the Fortress into a fight for her life. The best part is that her fears may be credible. Replacing the dying Superman was discussed in the first issue along with the new�references to Future Supermen I'm inclined to believe there's more to Lois' birthday present than Superman claims. Morrison includes some of his own established Superman cannon in his clever updates of the Fortress. I spotted the the infant universe of Qwewq from JLA: Classified #1-3 and I'm pretty sure that orb in the armory is "if" from JLA #5. Don't forget Superman from DC One Million and his arch�nemesis Solaris the tyrant Sun. Is the baby sun eater a�reference to Final Night? I'm not sure about that one but you certainly see its uses should Solaris show up at all. In all I was impressed and entertained by Morrison's clever updates and stand up work on character and story detail. This new cliffhanger leaves me just as anxious for the next issue as the last one. I guess my Showcase Comics Presents Superman will have to hold me over till then. Art - 5: This five goes to the whole team not just Frank Quietly. The colors and inks in this issue are spot on and�subtly lend to the alien nature of the Fortress and the growing anxiety of Lois' paranoia. The plain walls are lit with such atmosphere that it works better than any silly "tech" they could have put there instead. The POV shots at dinner were fantastic and lend physical context for an abstract feeling. Loved the design of the Superman robots, Lois' costume and the Unknown Superman's "S" Shield was inspired. Quietly conveys space and motion with simple�cinematic style that makes Lois'�flight through the Fortress easy to follow. I really enjoy Quietly's Superman. He's very nonchalant and it makes the impossible element completely�believable standing next to him. Cover Art - 5: Excellent work. The tag line, Superman with his back to us, Lois with a weapon - it makes we wanna know what's going on without telling me anything.